RED RIVER Incandescent rivers of lava pour out of fissure 8 on Kilauea’s lower east rift zone, filling an open channel and flowing swiftly toward the ocean. Lava fountaining out of the fissure and then cooling rapidly has also created a 55-meter-tall cinder cone, visible against the smoke. July 4th fireworks have nothing on Kilauea. As the Hawaiian volcano’s latest outburst enters its third month, scientists are still watching Kilauea 24/7. 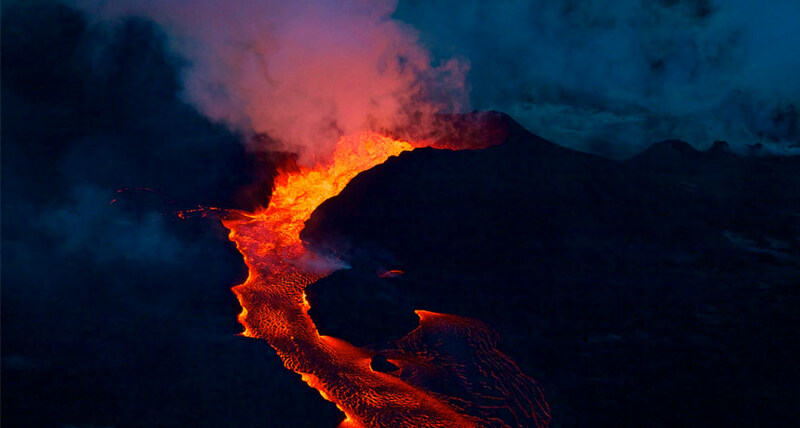 Such constant monitoring not only provides danger warnings aimed at keeping those nearby safe, but it also offers remote viewers the rare opportunity to observe the evolution of an eruption in real time. As magma within Kilauea’s summit crater, called Halemaumau, continues to drain and move toward the lower east rift zone, the crater floor is becoming increasingly unstable. The U.S. Geological Service has observed frequent rockfalls into the crater since mid-May; each collapse triggers a small explosion. One of the largest explosions happened June 30, when a collapse-explosion cycle released energy equivalent to a magnitude 5.3 earthquake. While a “Whomp!” and a slow-rising cloud of volcanic gas and ash marked that collapse, the real pyrotechnics are happening along nearly two dozen fissures, vents through which lava erupts, in that lower east rift zone. Lava fountains spurting from two fissures, Nos. 8 and 22, are feeding most of the lava flows now pouring into the ocean. It’s hard not to stare slack-jawed at images of molten rock spurting into the air, of glowing, fast-moving rivers of lava rushing into the ocean, or of the tangles of wispy-sharp shards of glass known as Pele’s hair. Check out these highlights of Kilauea’s show and the science (and volcanic vocabulary) we’re learning from them.